The second session of 2018 for the Latina Hope Program begins in September with a series of meetings to facilitate earning and networking for micro-entrepreneurs who want to start a new micro-business and advance their business idea. At the end of the sessions, participants can be awarded the Latina Hope Ignite fund. This competitive-based award provides materials (up to $250) to facilitate the startup phase of the new micro-venture in the McAllen area. The program begins with basic workshops on finance, single entry bookkeeping and operational management as well as marketing and business plan development. 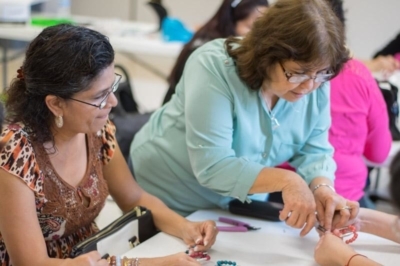 In following sessions, participants have the opportunity to learn at least two crafts skills. This includes candle making, card making, jewelry making, knitting/crocheting/quilting, sewing and alterations, soap making, toy making, wreath making and many other handmade skills. After attending five training sessions, participants then prepare a project plan (basic business plan) and present their business idea to the Latina Hope judging panel. The panel then decides if the project is mature enough to receive the Latina Hope Ignite fund. In Latina Hope‘s last session, 16 women received grants. Latina Hope is a free community event. Sessions are from 9-11 a.m. Sept. 5, Sept. 19, Oct. 3, Oct. 17, Nov. 7 ad Dec. 5. All sessions take place at Calvary Baptist Church, 1600 Harvey Street, McAllen. For more information, visit latinahope.com or facebook.com/LatinaHope.